Markings, Inc. Pembroke, MA was founded in 1967 by Steve Stella with his brother-in-law as a partner, and a couple of hand-push paint machines loaded in the back of a pickup truck. Our first jobs were commercial parking lots, and our biggest customer in those days was Friendly’s Ice Cream Restaurants. In the early 1960’s the road markings industry was still in its infancy, but we did $50,000 of business that first year, thanks to our high standards. From the start, our philosophy was to do the best possible work, and to keep every commitment. We made sure that we always were on the job when we said we would be there. In our second year, we added another crew. Soon we added several more crews and began to take on city and town projects. Within 5 years, Markings was big enough to complete its first state contracts. Over 40 years later, we run a dozen crews all season to complete projects all over New England, for towns, cities, states and highway contractors. Our goal is always to create a longstanding client relationship based on trust, service and quality workmanship. Markings has been a family-owned, family-run business from the start. Current owner and President Monique Souza is Steve’s daughter, who grew up with the company and began working with the road crews while still a teenager. Another daughter, Alicia Climer, handles payroll, accounts and bookkeeping and will soon become a part owner as well. 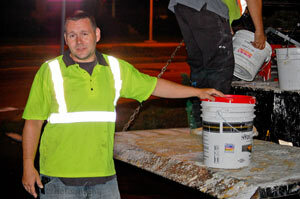 Steve continues to be the face of Markings for sales and bidding, with other family members also part of the operation. Monique’s husband, Philip, is a supervisor, one of her two sons is now working in the office and her other son works on the road crew in the summers, making them the third generation in the company. While family is the core of the Markings team, it’s not the whole story. Many of our supervisors have over 25 years of service with us, and most of our crews learned their trade from us. These are the people we rely on to uphold our standards: people we have trained ourselves to adhere to our values, and to communicate well with clients and with each other. Their skill, experience and dedication to excellence helps make Markings the best in the industry, and that makes all the difference.